Gumption, however, showed resolve and decided to go on strike. Virtute and I tried many things to convince her that eating the new food was in her best interest. Virtute said, “This is the best deal you could possibly want. You get a shiny new bag of food that is packaged in very stylish shimmering crinkly paper.” I tried to scare her into it by refusing to feed her if she didn’t finish her food within an allotted time. Jenny kept saying, “During the “labour disruption” this is the best deal you are going to get.” It was annoying for everyone in the house. We all had to deal with Gumption’s consistent meowing or her angry booty twerks each time we poured a “kibble mix” into her bowl. But something began to change. As Gumption’s strike neared the three week mark, we began to get letters of support from her friends Remus and Ash. Radar, our stuffed raccoon friend, refused to nap with us anymore. We knew that we were fighting a losing battle. 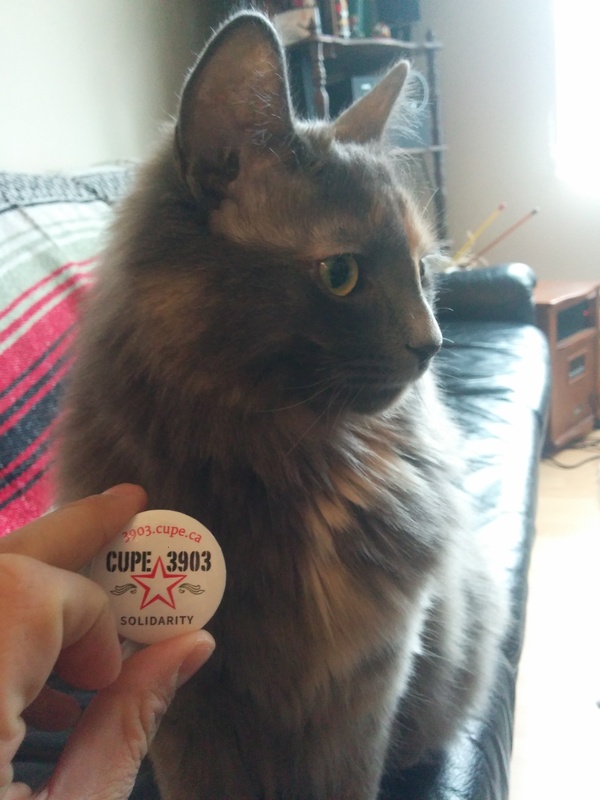 So last night, in honour of the end of the “labour disruption” at York University, we celebrated by giving Gumption a full scoop of her favourite kibble. She went to work, eating every single piece and purring the entire time. And so a couple month-long battles resolved themselves last night. We know that there are many more to come and we know that we haven’t seen the last of Gumption’s tenaciousness, but we all learned an important lesson about commitment, determination, and solidarity.